In the early days of 1981, a new toy made its way to the West over the Iron Curtain. 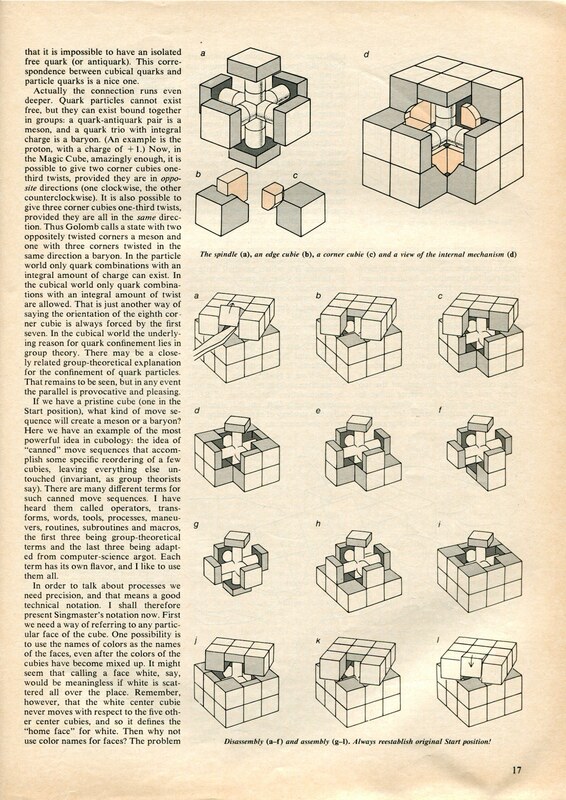 A few years earlier, a Hungarian architecture professor named Ernő Rubik had developed a “Magic Cube” while tinkering with ways to express rotation in 3D space in a single object. It wasn’t until he scrambled this 3×3 cube’s constituent parts that he realized his thought experiment prop could also be a puzzle. While the now-patented cube languished on Hungarian toy store shelves for a few years, Rubik sent out feelers to Western companies to develop his invention as a commercial toy. At the 1979 Frankfurt Toy Fair, Rubik’s agent debuted the cube in the West. Within a year, it was snatched up by Ideal Toys of New York. In the Scientific American cover feature, cognitive theorist Douglas Hofstadter writes in-depth about all aspects of the Cube in the discursive, free-flowing style that made his Pulitzer-winning Gödel, Escher, Bach: An Eternal Golden Braid (1979) such a smash hit. Hofstadter’s Scientific American essays written after the flush of post-Pulitzer publicity were so popular, in fact, that they were collected in their own book, 1985’s Metamagical Themas. While word of the Cube was beginning to filter through academic circles in mathematics and computer science throughout 1980, Hofstadter acts as a proselytizer for the Cube to a wider audience. Hofstadter talks about the cube’s history, construction, and other historic puzzles of the same ilk (including the “15 puzzle,” which has been around since the 1870s). Throughout his discussion of the math and topology of the Cube, Hofstadter helps popularize the terminology and notation systems of the growing grassroots community of Cube enthusiasts (“cubists”). He even engages in some flights of fancy on how the constituent “cubies” of the Cube resemble the subatomic physics of quarks. 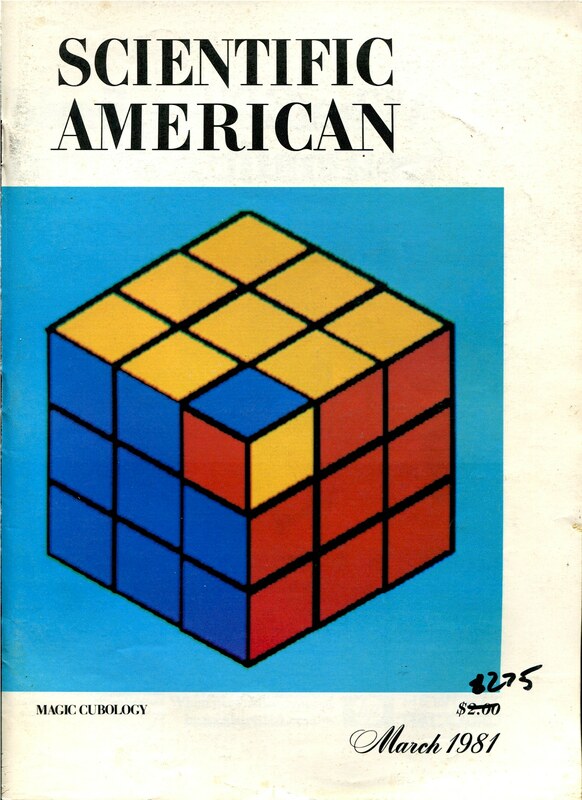 The Scientific American article helped not only solidify the Cube’s popularity with the highly technically-educated audience, but aided tremendously in getting word-of-mouth out to a wider toy, game, and puzzle enthusiast audience. And this priming of the pump paid off in a major way. The Rubik’s Cube was the hit toy of 1981, selling hundreds of millions of units worldwide. Mass speed-cubing contests followed throughout 1981 and 1982, with competitions televised on early ’80s “reality show” That’s Incredible. The Cube even became a character on its own Saturday morning cartoon, 1983’s Rubik The Amazing Cube. Ernő Rubik remained in Hungary, inventing and selling several other variations on the Cube, as well as editing puzzle magazines and opening his own industrial design firm in the mid-1980s. Amazing how this toy is perhaps the #1 prop sought after for any ’80s period film, lol. Not too long ago, my Gen-X co-workers and I revisited the That’s Incredible episode where Minh Thai won the world record for the fastest cube solve. We were all blown away by the feat. 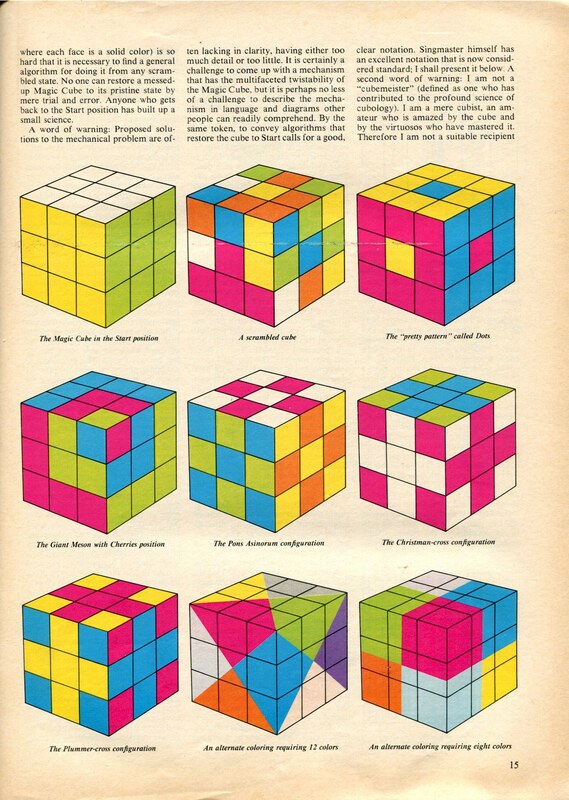 Back in the day, only the nerdiest of nerds could solve the cube without using any of those “solution books,” and others like myself tried and tried in vain until the cube became nothing more than a multi-colored paperweight or shelf decor. I still can’t solve it to this day, just to let you know. Nobody that I knew back then would ever admit that they used a book to solve it. I remember going to my local library and seeing quite a few different ones, each with a different method of solving the cube. As much as I was tempted to use one to my advantage, I decided not to, as I saw it as a form of cheating. There were kids who bragged that they solved it, even though it was never proven nor shown that they’d done so. I had friends that tried to carefully remove the jumbled stickers and replace them on their right sides in order to make it appear as if they’d solved it. There was even some discussion on the best solvents to remove the stickers and the best adhesives to stick them back on. For some who did it carefully enough, it was actually convincing. I’ve been fairly Rubik-obsessed the past year or so. I was a little young and not a mathematical genius so I am sorry to report I certainly never solved it. I do remember idly peeling off the stickers, but it was a bit of a telltale heart thing, as you say. As far as the Cube as an object, you can see why Rubik invented it for design and architecture students and spent so much time perfecting it. It’s sort of elegant in how it moves through space and how it interacts with the human hand. You know, after revisiting the That’s Incredible episode on YouTube with Minh Thai making the world record of the 26-second solve, I tried tracking him down in hopes of getting an interview or something. For the longest time I couldn’t find him, then out of nowhere, I found this totally candid video of him taken in 2015, solving the cube at his office desk! Aw jeez, that was amazing! And that flip at the end!